To my mind dates are underused far too much, except in the Middle East where they are revered. Their sweetness when paired with a salty ingredient like feta work so well together. This salad is a great favourite of mine, it is an excellent way to start a meal. Venere black rice is often known also as purple rice. To make the dressing… Place all the ingredients, except the mint leaves, in a bowl, whisk together, add the torn mint leaves, season to taste season to taste. 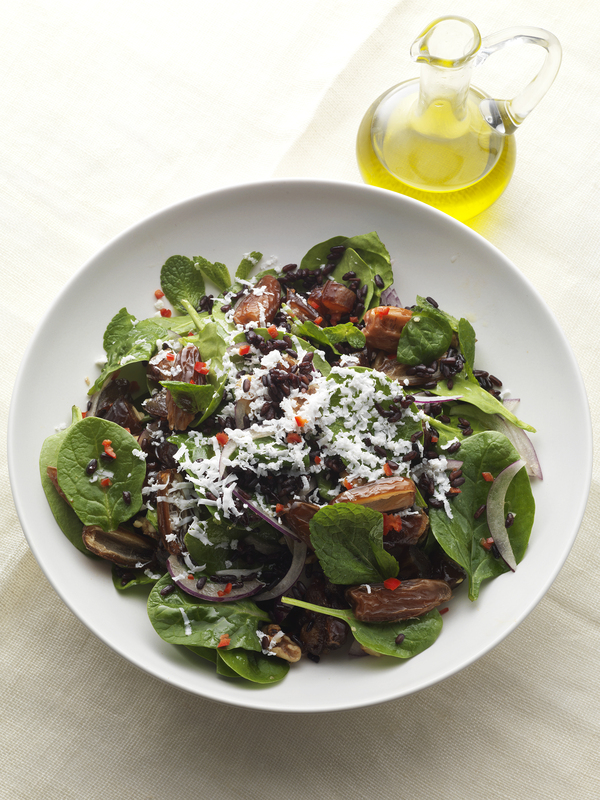 To prepare the salad, place the spinach leaves in a bowl, add the dates, cooked black rice , chilli ,red onions and walnuts and season lightly with salt and pepper.